BEUMER was founded in Beckum, Germany, in 1935. Since the very beginning, the company has always been an independent, family-owned enterprise. The company has developed into a market leader in the fields of conveying, loading, palletizing, packaging, as well as sortation and distribution systems provider. The exceptional qualities of BEUMER products combined with the application of advanced technologies have resulted in over 65 years of continued customer satisfaction. BEUMER does not merely offer standard solutions, but designs, builds and installs systems customized in details to the specific project requirements. The large variety of project requirements demands tailor-made solutions from the first project concept through After-Sales-Service. BEUMER’s palletizing systems have established new standards of performance with respect to function, types of material handled and overall throughput. 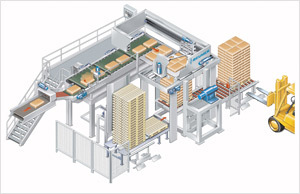 BEUMER palletizers with throughputs of more than 4.000 bags per hour are currently in operation all over the world. 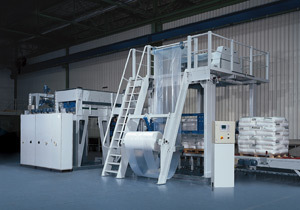 BEUMER’s packaging products for palletized loads include various types of shrink and stretch wrapping systems as well as advanced technologies for stretch hood systems. Numerous process engineering and design patents testify to BEUMER’s continuous development of innovative technologies.